Many moons ago, Locus was the first game I worked on at Zombie Studios, as co-designer and producer. It was the first game designed from the ground up to be played with a head-mounted display such as Virtual i-O i-Glasses, CyberMaxx, or Forte VFX1. The game handled 6 degrees of freedom (yaw, pitch, and roll) so it really felt like you were inside the game. We also supported force-feedback joysticks. Here’s a re-creation of the original Locus web page. Recently I was delighted to see that a retro game aficionado got his hands on Locus and gave it a thoughtful review. Incredibly, some people in the comments remember it fondly! Zombie was an amazing place. It was created and run by Joanna Alexander and Mark Long, partners who had previously run a military simulations and VR visualizations lab at the Sarnoff Research Center. They hired a bunch of promising but completely untested young people, mostly women, as producers, developers, designers–providing us with enough rope to hang ourselves with, and the mentorship to be successful taking huge risks. A core group of us are still dear friends–it was a creative and professional crucible that launched us into our current careers. I have to admit to being a bit jaded and skeptical watching the second wave of consumer VR hit and get hyped with Oculus Rift, HTC Vive, along with phone-based VR (Samsung gear, Google Cardboard), and 360 video. But after trying Google TiltBrush on the Vive, my interest in VR has been renewed. More on that later. 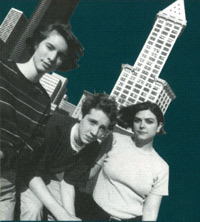 Christine McGavran, Mike Dussault, Janet Galore, 1995.